Cook bacon in large skillet until crisp. Drain on paper towels. Crumble bacon; set aside. In 13x9-inch (3-quart) glass baking dish, layer lettuce, cauliflower, carrots, mushrooms and onion. In small bowl, combine mayonnaise, milk and mustard; blend well. Spread evenly over onion layer. 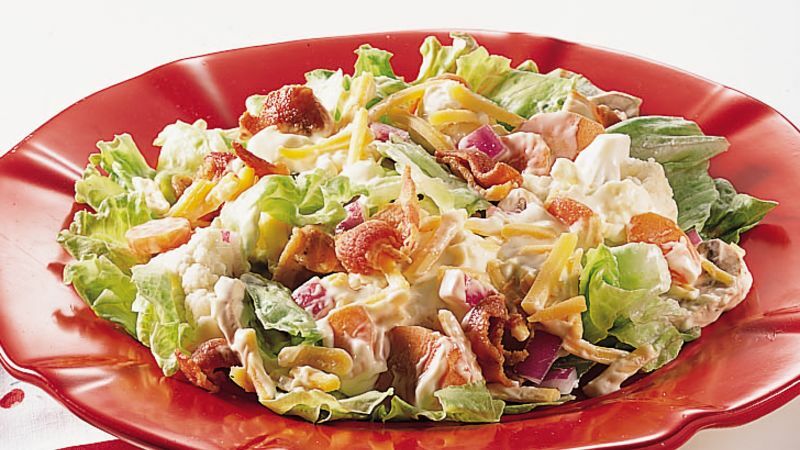 Layer cheese and bacon over mayonnaise mixture. Cover; refrigerate at least 8 hours or overnight.